Aubrieta, iberis, tulips, muscari, berberis. Hedgehog holly, viburnum, choisya, sedums. That's gorgeous, TT! I bet that stops a few people to admire it. I thought of you, Paul, when I made sure the Hedgehog Holly was in the pic. Beautiful Spring shot, so full of colour. Wonderful colours there Tt ! Lots of planning and forethought gone into that . oh my word! it's so amazing!!! I've done my best to set other perennials in between the spring flowers, so that I also have summer and winter-flowering plants. Very colourful ... All the colours of the rainbow are there :o) It's very pretty . The rain made everything bloom even more ! This is garden of dreams, Terra. Those blue blooming plants grow each year again and again or do you have to plant them each spring? Everything in my gardens is perennial, and mostly evergreen. So all the plants, trees and shrubs flower every year, and most keep their leaves through all seasons. What a show Terra:) Hedgehog Holly? not familiar with that one;-) is that one in front of Berberis? You are SO clever. The colours and plants you choose are just gorgeous. Thank you. It's quite a mixture there... not exactly a structured plan ... Lol. I'm picturing tour buses driving by your house all day...gorgeous! Today I am going to buy Aubrieta to the GC. Thanks Moti, Scottish, Neena, Lil. I am dissappointed. Today I was in three GC. They do not have Aubrietas. What a shame, isn´t it? Katarina ... aubrieta can be grown from packets of seeds .. maybe that would work for you ? Locally in my neighbourhood here, there seem very few people interested in gardens ...so its good thing I can put garden photos on GoY and share my hobby that way ! Good point. Thank you. Will check seeds. What a wonderful sight....a really excellent spring garden. I love to see that TT! Brings joy to my soul! I bet your neighbours (most of them) love to see this as they pass. Thanks for such a lovely comment ... I'm still learning, and all this morning I've been outside gardening, moving plants around where I decided I put them originally in the wrong places ! Terra, how come every time I see a beautiful picture of a garden on here it turns out to be yours? Always so colourful and perfect looking, well done! Lol. Thank you ... I was working out there this morning, and a very nice neighbour from around the corner enjoyed a tour around my garden admiring the flowers. Yes, I agree. You wouldn't believe how cold it is here today...bright sunshine, no clouds and absolutely freezing. People in the streets in hats and gloves! It's great to sit with Goy on my lap looking at pics. of spring when it's so awfully cold out there! It was cold first thing, but warmed up, so I was soon able to work outside without a coat. I have taken lots of pics of my aubrieta etc., so will try to put some onto computer this week. Looking forward to that very much. In my old house there was a neighbour nearby had a terraced front garden like this. Loads of tumbling aubretia, red and yellow tulips, daffodils...all tumbling down the slope and it was something to look forward to every year. I didn't envy them, it was right at the front, sloping away from the house so they didn't see it, only us lower down the hill could enjoy it, and it looked like a lot of work! In my front garden I've created slight gradients, which means the garden is a little higher near the road, sloping gently down to the house. So myself and an elderly neighbour next door get the best views ... Lol. Wow TT Truffle & Conker have been busy! Lovely display TT. I love aubretias as they bloom so long and show themselves off so well. They are tough as any flower too and long lasting. The Hedgehog Holly is a lovely compact bush. Thanks for your comments. Yes, aubrietas do bloom for many weeks ... wonderful plants. The Hedgehog Hollies fascinate me. I have three of those now. wow, very lovely picture and full of flowering plants, so beautiful Terratoonie! Hi Junna .. Thanks .. I'm pleased you like my garden. This week, the rain is giving all the flowers a very good watering ! 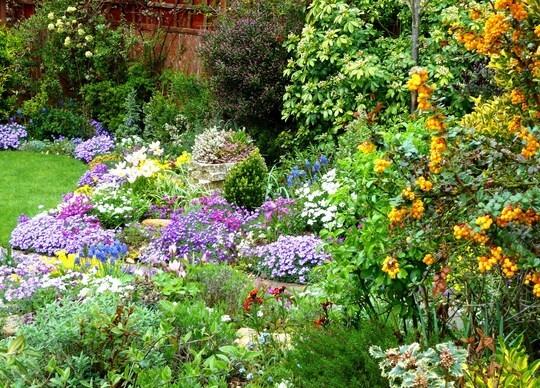 Hi Terra, your garden looks very colourful, and mature with the shrubs bordering the flowerbeds. Something I lack in this garden as it's so small. We've had quite a lot of rain the last few days. The bird seed was floating in the dish and the birdtable seeds afloat in there too so must sort that out if there is a dry spell. The squirrel was fishing to get his food yesterday LOL. Thanks. Yes lots of rain this week, and more to come ! The earth needs it Terra, and it needs to soak right down into the lower layers so that it filters into the bore holes. We need it for our rivers and streams too to help the wildlife. That lifts the heart, TT. It is simply perfection. It also depresses me slightly when I think of my poor patch and how much work I need to do to get even vaguely near this standard. Thank you for sharing. Hi Gattina .. Thank you ..
My gardens have been rained on almost constantly for the past week or so. They must be in shock ... no rain for weeks and then daily downpours ... Lol. Let's hope the vinca and bindweed don't have other design plans for your plot... Lol. What a delight for the eyes. comment came out twice ! Lol.